Look here for accommodation amidst some of England's best scenery! Pretty harbours, towering cliffs and beaches for lazing or surfing! Choose a cottage in the South Hams district of Devon, and you will be near tidal estuaries that run far inland between fields and woodlands, stunning sandy beaches, picturesque villages, and beautiful stretches of coastline. 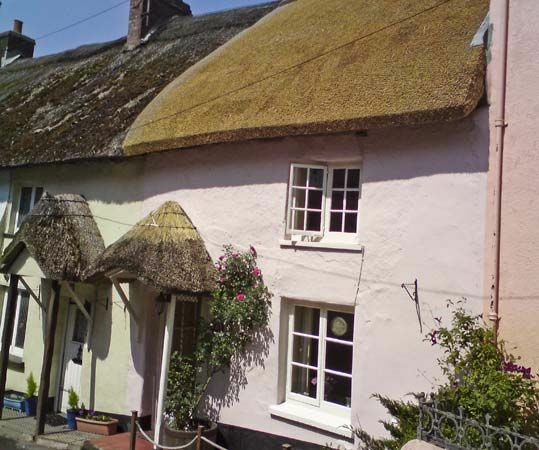 This pretty, white-washed, thatched cottage, is an ideal location for exploring the nearby Kingsbridge estuary and the many beaches, coves and pretty villages of South Hams. 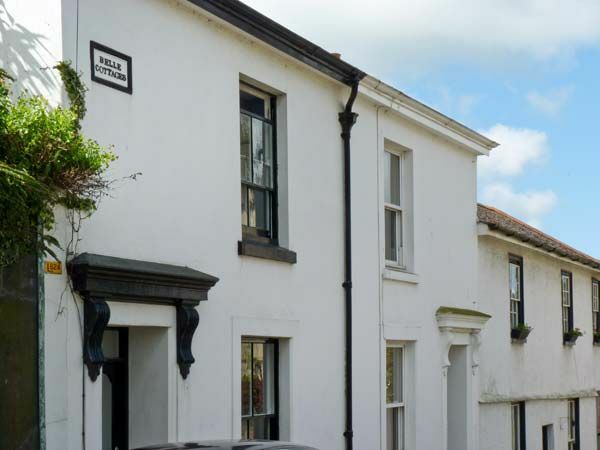 Charming Victorian terraced cottage set in a quiet street in the town of Kingsbridge. Ideal for exploring the South Hams area. All the holiday cottages listed here are on the South Coast Riviera with its golden sands and sub-tropical trees and flowers. They are within a few miles of the coast in beautiful resorts including Torquay, Brixham and Paignton. This sixteenth-century thatched cottage is a short stroll from a village on the estuary of the River Teign, opposite Teignmouth. Shaldon has a sandy beach and a range of shops and pubs. Set in the countryside on a farm in 65 acres of fields and woodland with private fishing lake. Good base for exploring Devon. Exeter 6 miles. Dartmoor 4 miles. All the cottages shown here are close to the north Devon coast. Along this stretch of coastline are long surfing beaches, the cosy harbour at Ilfracombe, the three miles of golden sands at Saunton Sands beach, the charming village at Croyde Bay, Woolacombe with its long sandy beach, and the pretty village of Clovelly with its cobbled streets. Formerly a cider press, Appleloft is a spacious, two-bedroomed semi-detached cottage. Beautifully decorated and furnished with both antique and period furniture but with modern amenities. Solid oak floors in living/dining room and wood-burning stove on slate hearth, bespoke kitchen with double range cooker, farmhouse table and wood floor. Sandy beaches are within easy reach at Instow, Woolacombe and Saunton. Set in spacious well-maintained grounds with two fishing lakes and a children’s play area. You can walk around the grounds and explore local footpaths. The nearby village has a pub and local shop. The cottage is near Woolacombe and the renowned surfing beach at Croyde. Our Dartmoor cottages are in a wild, rugged and yet beautiful part of Devon, close to moors and mountains, woodlands, remote villages, combes (valleys) and market towns. A cosy thatched cottage with roses around the door. Little Holme is on the village green in the centre of the pretty village of Lustleigh. Ideal for walkers, with walks on the surrounding moorland, and at nearby Widecombe, Chagford and Haytor. Choose a cottage in Central Devon, and you'll be near beautiful countryside, market towns, derelict iron and copper mines, ruined castles, thatched cottages, woodlands and the orchards of Devon's renowned cider industry. Characterful cottage in quiet location near the River Taw and a short drive from the North Devon beaches. Situated in a good location for walking, between Exmoor and Darmoor, and in the centre of a village. Cottages in Exmoor are close to coastline, moorland and heath. The heath is the home of red deer, grouse, ponies and sheep. It is fine terrain for walking and there are waymarked paths across Exmoor from Dunster, Minehead and Porlock. A coastal footpath runs between Minehead and Combe Martin, and there is a two-mile nature trail at Heddon Valley, south-west of Lynton. The attractive twin town of Lynton and Lynmouth is on the coast but within the Exmoor National Park. The beautifully renovated old fire station provides spacious accommodation in an attractive position opposite a church and only a mile from the sandy beaches of Combe Martin. Combe Martin is on the edge of Exmoor National Park and on the South West Coastal Path and Tarka Trail. Shops and a pub serving food are only five minutes’ walk from the accommodation. The fire station has a woodburner in the living room, underfloor central heating, and an enclosed garden with large decked area. In a quiet location, this semi-detached bungalow, is ideal for exploring Exmoor North Devon’s dramatic coastline. There are plenty of walks in the area. Parking is available on site.